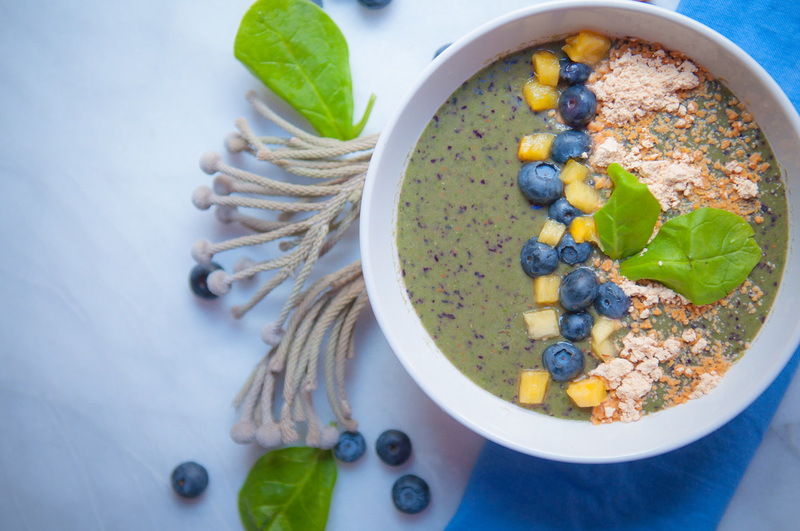 I started my first day of 2016 by making a super healthy Peanut, Blueberry, Spinach and Pineapple Smoothie Bowl. It is a goal of mine this year to maintain a plan of healthy eating and regular exercise. 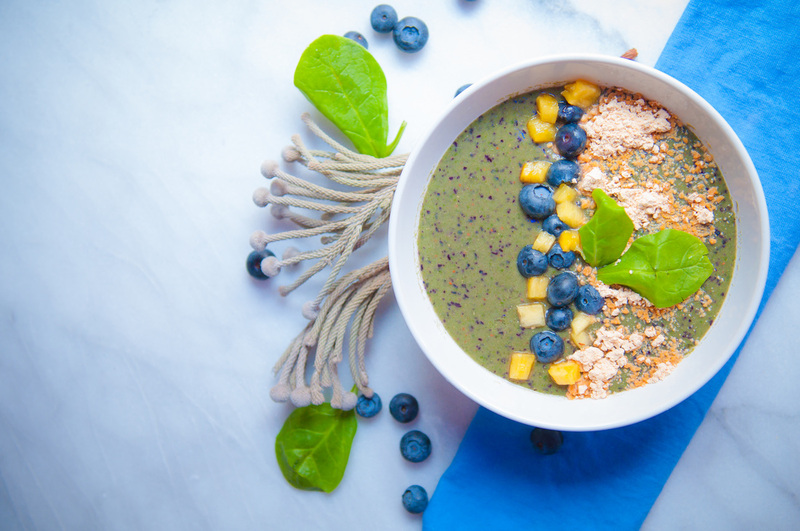 This Peanut, Blueberry, Spinach and Pineapple Smoothie Bowl will give you a great boost to your day because It is not to heavy for those of you who will hit the gym later. Also, if you need a quick breakfast that is filling and delicious, then this is a great fix. 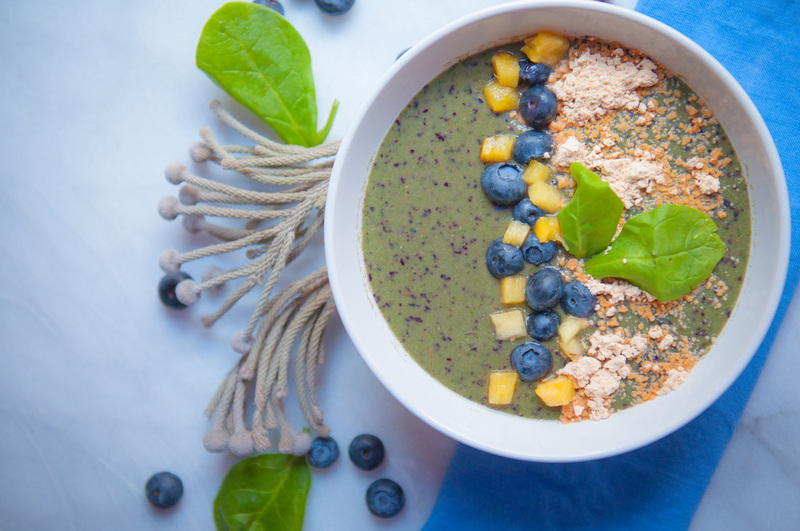 The fresh blueberries and pineapple balance well with the spinach and peanut butter powder. It is not too sweet and not too creamy.The peanut butter powder is the special ingredient in this bowl. Last year, I cooked mostly Thai and Chinese food. I also had the opportunity to the bake extensively. This really was my favourite part. I thoroughly enjoyed creating new smoothie recipes. Finally, I also started to review some Thai restaurants as well as brunch and breakfast options around the city of Chicago. This year I will continue to cook more Thai food specifically more authentic recipes. Some ingredients may be more of a challenge to find, but I will post links as to where they may be found. I hope to tackle more international cuisine including Mexican, Korean, Italian and Japanese recipes. A more extensive breakfast and pastry recipe offerings are also in my plans and will contain a variety of healthy options. I love starting out my day with a great smoothie. I like to balance out my daily diet, and my desire for good food and smoothies are a great way to do this. It acts as a healthy balance in between big meals. I am also really into the creation and crafting of great cocktails. I hope to have some good cocktails for you to try and entertain guests with. 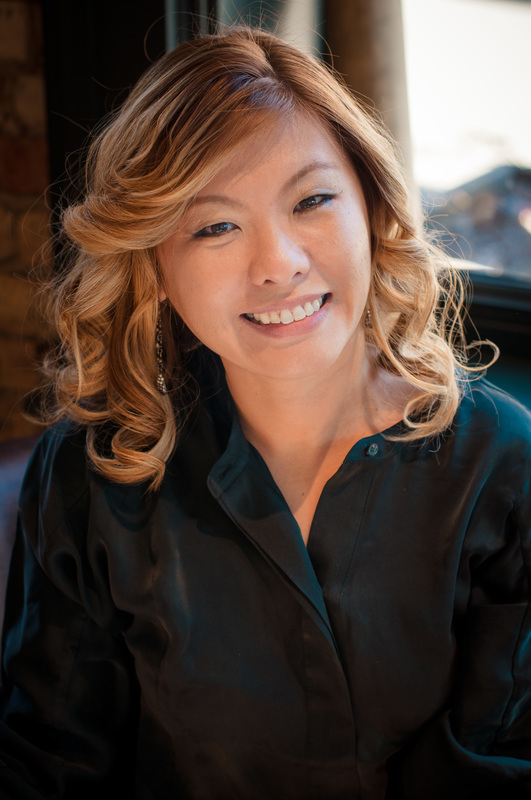 I hope that I will also expand my restaurant reviews, and this will give you more options of places to eat in Chicago. Thank you for all your support from 2015, I am looking forward to finding more recipes and reviews to benefit you in 2016. In the blender mix almond milk, pineapple, fresh blueberries, baby spinach and peanut butter powder. Blend all ingredients until smooth- about 1 minute. Severed in the bowl, topped with fresh blueberries, fresh pineapple and peanut butter powder.